Warning: this post contains photos of a somewhat sensitive nature. Especially if you are a mother. Particularly a mother of a three year old boy. 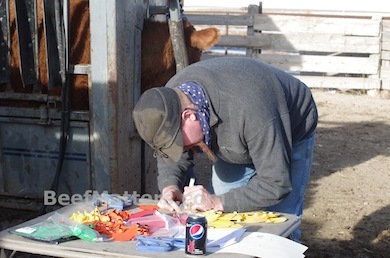 Today we had our veterinarian at the ranch to preg-check cows for us. 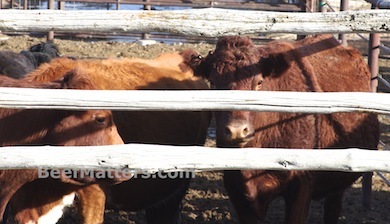 At the end of the day we sorted the cows based on when they are due to calve and then took them to separate pastures. To determine when the cow is due to calve, our vet does a rectal palpation and feels the cow’s uterus. It is not a job for those with an aversion to mud or muck. You may look at this photo and feel some compassion for the dirty job our vet had to do all day long. Me? I look at that photo and thank my lucky stars I am not responsible for his laundry! 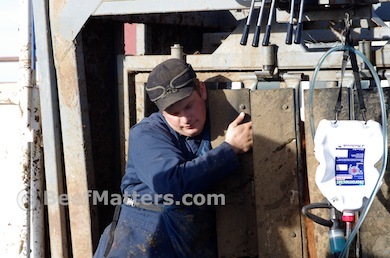 It is a quick process, the cow is in the chute for less than a minute. 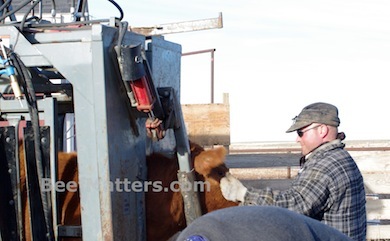 While the vet is working on one end of the cow, the cowboys are at the head of the cow. They give vaccinations and make her a new ear tag. 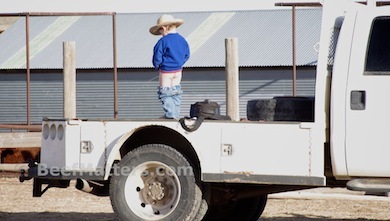 While the cowboys were hard at work, I was busy tending to the resident three year old. I would like to go on record here that I was doing a perfectly fine job of watching him and playing with him…until the phone rang. A proud parenting moment indeed! Funny! Something about boys…it’s a good thing we don’t have close neighbors! At least the camera bag was dry! right? Have a great weekend.